The Art of Aspen Comics: Volume One. Damsels in Excess #1 SDCC 2014 exclusive wraparound cover by Jordan Gunderson and Mirka Andolfo limited to 200 copies. Damsels in Excess #1 SDCC 2014 Century Edition, cover by Siya Oum limited to 100 copies. 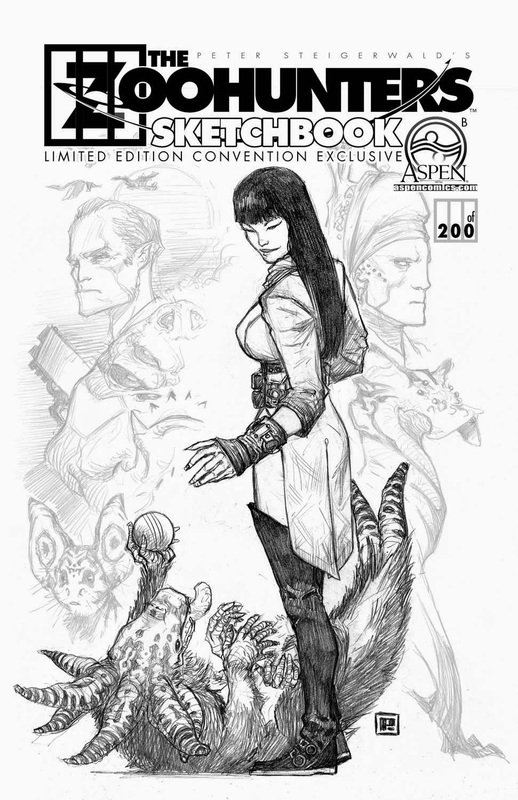 Lola XOXO #3 SDCC 2014 exclusive cover by Siya Oum, limited to 250 copies. 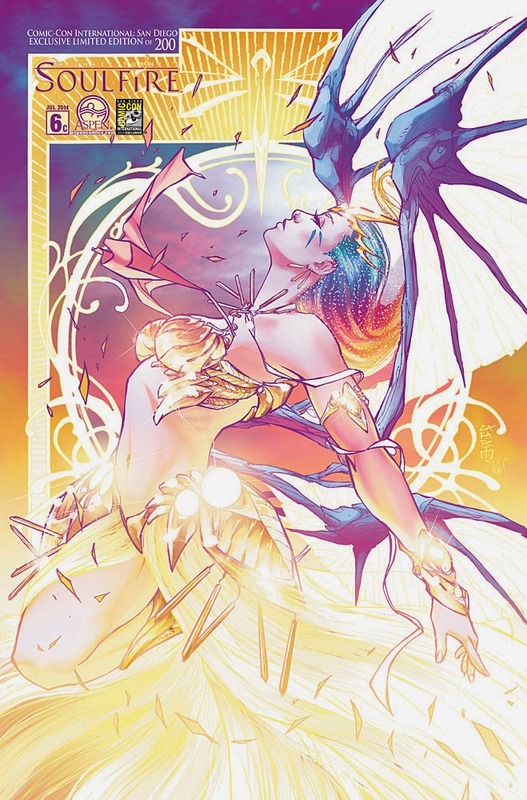 All New Michael Turner’s Soulfire #6 SDCC 2014 exclusive cover by Giuseppe Cafaro and Peter Steigerwald, limited to 200 copies. 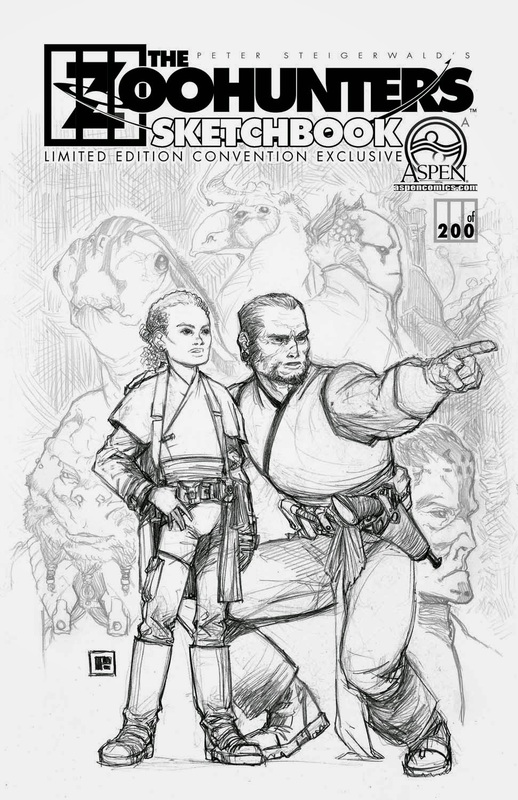 The ZooHunters Sketchbook Convention Exclusive Limited to 200 copies (Featuring Two Different Covers). 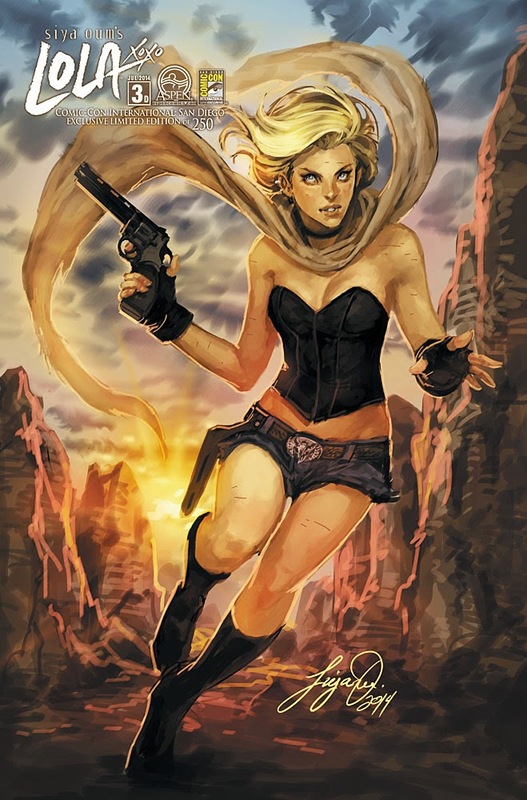 7 New Aspen Comics Full Size Art Prints featuring: Lola XOXO, Damsels in Excess, Jirni and All New Michael Turner’s Soulfire. Five SDCC 2014 exclusive “Daily Prints” by J. Scott Campbell and Peter Steigerwald, only available on respective show days (Wed-Sun), limited to 50 editions. 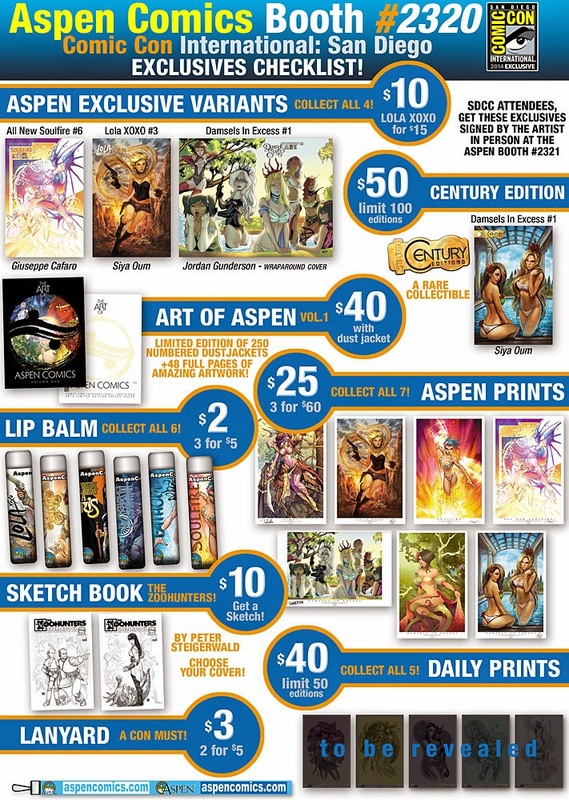 Aspen Comics Lip Balm SDCC exclusives – Michael Turner’s Fathom, Michael Turner’s Soulfire, Executive Assistant: Iris, Lola XOXO and Damsels in Excess flavors available. Aspen Comics SDCC 2014 exclusive lanyards. Frank Mastromauro (co-owner), Peter Steigerwald (co-owner), Vince Hernandez (VP, editor-in-chief), Mark Roslan (VP, director of design and production), David Wohl (Executive Assistant: Iris), J. T. Krul (Jirni), Siya Oum (Lola XOXO), Scott Lobdell (Superman), Paolo Pantalena (Jirni),Giuseppe Cafaro (Fathom: Kiani), Jordan Gunderson (EA: Assassins), Lori Hanson (EA Assassins), and Beth Sotelo (Fathom) will reveal upcoming Aspen titles as well as projects on the horizon. They will also hold a Q&A session with fans. All fans in attendance will receive a gift courtesy of the publisher. 2:00-4:00 - Peter Steigerwald (The ZooHunters), Siya Oum (Lola XOXO), Paolo Pantalena (Jirni), Jordan Gunderson (Executive Assistant: Assassins), Giuseppe Cafaro (Fathom: Kiani), J.T. Krul (Jirni, All New Michael Turner’s Soulfire). 1:00-3:00 – Ale Garza (Fathom, Fathom: Kiani), Oliver Nome (Fathom: Kiani), Peter Steigerwald (The ZooHunters), Siya Oum (Lola XOXO), Paolo Pantalena (Jirni), Jordan Gunderson (Executive Assistant: Assassins), Giuseppe Cafaro (Fathom: Kiani), J.T. Krul (Jirni, All New Michael Turner’s Soulfire), Lori Hanson (Executive Assistant: Assassins). 5:00-6:00 - Peter Steigerwald (The ZooHunters), Siya Oum (Lola XOXO), Paolo Pantalena (Jirni), Jordan Gunderson (Executive Assistant: Assassins), Giuseppe Cafaro (Fathom: Kiani), J.T. Krul (Jirni, All New Michael Turner’s Soulfire), David Wohl (Fathom). 11:00-1:00 - Peter Steigerwald (The ZooHunters), Siya Oum (Lola XOXO), Paolo Pantalena (Jirni), Jordan Gunderson (Executive Assistant: Assassins), Giuseppe Cafaro (Fathom: Kiani), J.T. Krul (Jirni, All New Michael Turner’s Soulfire). 12:00 – 2:00 - Peter Steigerwald (The ZooHunters), Siya Oum (Lola XOXO), Paolo Pantalena (Jirni), Jordan Gunderson (Executive Assistant: Assassins), Giuseppe Cafaro (Fathom: Kiani), J.T. Krul (Jirni, All New Michael Turner’s Soulfire). 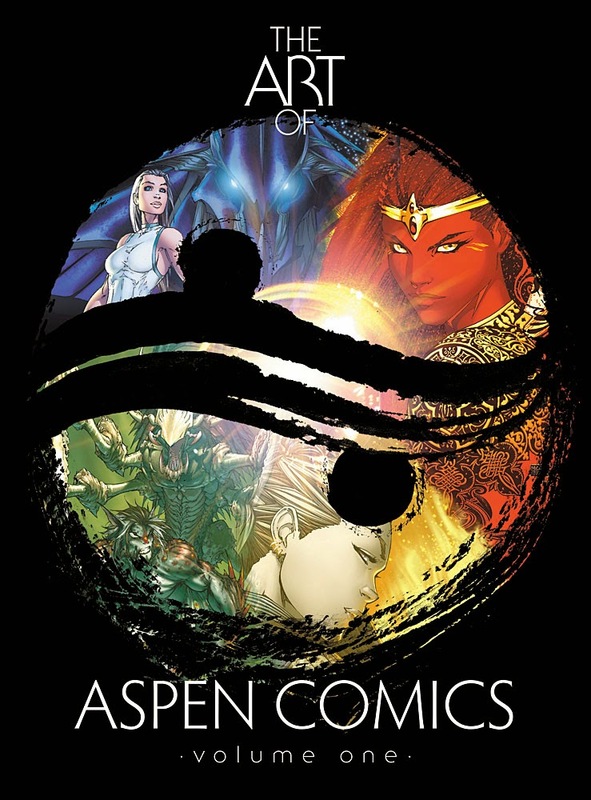 Aspen Comics will also be offering photo opportunities throughout the weekend with Aspen Cosplayers Katy Mor, Rosanna Rocha, Reva Dawn and Heather Finley.